Jacques Lacan read Of Structure as the Inmixing of an Otherness Prerequisite to Any Subject Whatever at the Colloquium on "The Languages of Criticism and the Sciences of Man," Johns Hopkins University, followed by discussion. In Richard Macksey and Eugenio Donato, eds., The Structutalist Controversy, Baltimore: Johns Hopkins, 1970. There is no French original. November 24: Yale University, Kanzer Seminar. General discussion of the interpretation of dreams and other unconscious formations as being centered on verbal material. 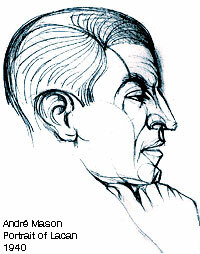 Lacan also discusses the factors that drew him to psychoanalysis and describes the "Aimée" case. November 25: Yale University, Law School Auditorium. Lacan begins by describing the hysteric as productive of knowledge, but he quickly moves on to a discussion of the properties of Borromean knots. December 1st: Columbia University, Auditorium School of International Affairs. A very general series of answers to questions, including comments on the opening thesis of Television, namely that it is impossible to tell the whole truth because the structure of language always introduces an element of fiction. December 2nd: Massachusets Institute of Technology. Lacan defines linguistics as that which gives psychoanalysis a hold on science, but adds that psychoanalysis is a practice, not a science. The imbrication of real, symbolic and imaginary is viewed in terms of the topology of knots. Lacan's lectures as much as the comments of sharp audiences amount to a general survey of Lacanian thinking. In Yale Lacan, greeted by Paul de Man as a succés de librairie, appeared subtle and cautious in his assertions. There is no transcription of his confrontation with N. Chomsky, who attacked him violently during the seminar on Le sinthome. The 1975 version published in Scilicet 6/7 provides a general survey. "A woman is a symptom for the man." "Psychosis is an attempt towards rigor. In that sense, I would say that I am a psychotic." "The acte manqué par excellence is the sexual act. One of the two is always unsatisfied." "To explain art by the unconscious seems very suspicious to me. To explain art by the symptom seems more serious to me." André Masson was born 1896, in Balagny, France; he died in Paris, the year 1987. It was 1924 when he met André Breton and was invited to join the Surrealist Movement. The encounter prompted the use of automatism in his work. In 1934 he married Rose Macklés, sister of Sylvia Macklés, who in turn married George Bataille, from whom she divorced to marry Jacques Lacan. Different legends tried to trace the ways in which Courbet's "Origin of the World" made it's way into Sylvia Macklés hands, but the legends seem to contradict each other. Say we stick with the one that says that Sylvia was the one to give the actual painting to Lacan… Lacan put the painting in his country house - at Guitrancourt - inside a wooden box with a sliding door, and André Masson was asked to paint a sketch of the Origin of the World on this sliding door..